Democratic Socialists of America (DSA) is a broad-based working class organization that seeks to bring about a fundamental shift in the direction of our society away from the destructive social and economic system of late capitalism and towards a more just, equitable, and harmonious system of human relations. In its never ending pursuit of profits, the capitalist version of globalization has shown itself to be ecologically catastrophic and fundamentally anti-democratic. At every turn, the cycle of booms and busts helps to consolidate power and prosperity in the hands of the few while relegating the many to poverty or the constant threat of it. As a result, liberal democracy is in retreat. In the vacuum created by the global loss of confidence in the political center a reactionary trend towards tribalism is again on the rise everywhere, with authoritarian right-wing movements offering the false salvation of an exclusionary national, theocratic, and/or racial identity. Alternatively, the Democratic Socialists of America constitutes the assertion of a bold universalist left politics long dormant in the US, one that stands in stark opposition to both neoliberal capitalism and ethno-nationalist reaction. We are fighting for a new global order that unites working class people of all locales and identities, one that will secure the collective well being of our species and the planet we inhabit. Human society is again at a pivotal crossroads; now more than ever we must choose internationalism and the socialist expansion of democratic power or continue down the road to barbarism. 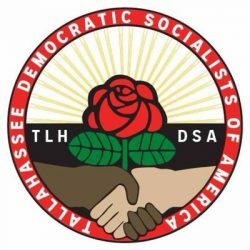 As the Tallahassee Local of the Democratic Socialists of America, we are fighting to expand the power of the working class over its conditions by building a cross-identity mass movement organized around class solidarity with the aim of facilitating a transition to a truly democratic and socialist society, one in which the means and resources of production are democratically and socially controlled. DSA offers a viable left wing alternative to both neoliberal capitalism and the right wing populist reaction it creates. We are a non-doctrinaire, multi-tendency organization that utilizes a diversity of tactics including: workplace and community organizing, electoral campaigns, legislative action, and education. Democratic socialist policies are broadly popular in the US and we will be mobilizing working class people to collectively realize those policies and build a better world for us all. We are not satisfied with the fringes of politics, academia, and culture; we want systemic change and that change can only be made by the power of an organized mass movement; we are working to build that movement.